A former federal Green candidate disavowed by the party for her anti-Semitic views is on trial in Germany for publishing videos denying the Holocaust. Schaefer and her brother, Alfred, are German-Canadian and he also faces charges in Germany for Holocaust denial, said Helmut-Harry Loewen, a retired University of Winnipeg sociologist who monitors hate groups. On the sixth day of the trial of Monika and Alfred Schaefer at the Munich court, 13th July 2018, Monika Schaefer gave her personal statement. Translation made by R. Edmonds. Monika Schaefer read out her personal statement, which according to the judge is usually not permitted. But the judge accepted that Monika dos not speak German perfectly, hence he decided to make an exception. Monika related how she became engaged politically and how she felt herself deeply drawn to Green politics. She campaigned many times for political office. That had all continued till she had learnt that Israel’s wars were being justified by false claims. There-upon she left the party. She had learnt very early to think for herself. She had made the video herself. Once she had made the film and put it in the public domain, she then felt a feeling of relief and felt freed from a heavy burden. She had always held her parents under a general suspicion, but now she knew that there was nothing to reproach them with, because History was quite contrary to what we had been told since 1945. This was this reason why she had apologized to her mother. As a consequence of the success of the video, she had lost many friendships; and a campaign of ritual defamation commenced against her. For example, in a small newspaper of a town with five thousand inhabitants, readers‘ letters started appearing, written by readers from quite other districts, who would not normally read the news-paper. These readers‘ letters served the purpose of defaming her. At the beginning, she had to force herself to go to her front-door. However when one deliberately and with conviction breaks such a taboo, because one knows that the official claims regarding the period 1933 -1945 are a shabby lie, then such ritual defamations are easier to bear. Every attempt had been made to intimidate her. For example, she always rides by bicycle, and one day at the traffic lights a car had sped away from her throwing the sand of the street against her. Also attempts had been made to ruin her financially. Not a single student from her locality came any more to take instruction on violin-playing. A regular witch-hunt was organised against her. This witch-hunt had split the community in which she lived. Whilst many had turned away from her, on the other hand, many others whom she did not know had come to her; and they could not understand what was happening. In July 2016 a new local law gave permission for music to be played in the local park close to her. A licence for this was needed, but this licence was refused to her. Finally her brother had made the offer, that it was better to come to Germany, if the situation in Canada should become too dangerous for her. The judge asked, why she had made a video rather than chosen to write an article. Also he wanted to know why she had given advice as to where information on the subject could be found, for example referring to the video about Ernst Zundel or “Questions about the HC.” Monika replied that she herself had found the sources very helpful in order to understand everything. She wanted to invite everybody to learn more in order to understand what had really taken place in the period of 1933 to 1945. In reply to the question from the judge, why she found the lie so shabby [threadbare, seedy, mean], Monika declared because the intention was that the guilt feelings should continue for ever. The fact that she was in prison proved that. Such forced measures are only good for conflict. OTTAWA — A civil liberties group is urging the Canadian government to end the "unjust and immoral" imprisonment of Monika Schaefer, a German-Canadian woman on trial in Germany for publishing videos denying the Holocaust. The Ontario Civil Liberties Association says it's concerned about Canada's apparent unwillingness to come to the aid of Schaefer, who it describes as a Canadian "political prisoner" who was charged with a German criminal law that does not exist in Canada and is contrary to international law. The SCHAEFER SIBLINGS’ TRIAL IN MUNICH, DAY 7, Monday July 16th 2018. Alfred Schaefer proves Pavlovian “hate law” Conditioning induces Family Denunciations: “Do it to Julia not to me”! Trial Reports Attract Action from Ontario Civil Liberties Association. The trial session started late at 10:10. The application for ending detention in the Alfred Schaefer case was rejected by the court because the postcards that Alfred the “teacher” had sent to his school teacher relatives were considered “threatening”. An open postcard sent to relatives can now send one to prison! Later on we shall hear more about that. Did Alfred’s family put him in prison for wishing them to be open to his opinions and those of historical figures? One thinks of Plato: “We can easily forgive a child who is afraid of the dark; the real tragedy of life is when men are afraid of the light”. The subject under examination was the second de-brainwash de-conditioning video by Alfred Schaefer. However, since the computer refused to work after 10 minutes, further delays occurred until the trial could be continued. One could observe that people now breathe daily an atmosphere of such “politically-correct” anxiety that they even ’self-flee‘ in case someone may ‘shop’ them for listening to or expressing what Alfred terms conditioning ’trigger‘ opinions. This being so, Alfred Schaefer’s successful insistence that the court watch his videos in full is proving quite a new experience for his countrymen who are lawfully forbidden to hear such alternative opinions. It reminds one of the telling quip by the half Scots/ half French professor Robert Faurisson. He often informs judges that his French half (on pain of jail) must not listen to his Scots half (for whom open debate is a norm not a crime)! Alfred introduced the video and quotes Sefton Delmer, the British propaganda chief in WW2. This, he teaches, is intended to represent a thinking aid, a bridge, which should allow the listeners to follow the video mentally and to understand the contents in context. Quoting Sefton Delmer: „We have won this war by atrocity propaganda and we start now really with it. We will continue this atrocity propaganda, we will increase it until no one is going to adopt a good word from the Germans until everything is destroyed that could bring them sympathy in other countries and until they are so confused that they no longer know what they should do. When this is achieved, when they begin to pollute their own nest, not reluctantly but with zeal to obey the victors, only then is the victory complete. It will never be final. The re-education requires conscientious, undying care like an English lawn. Only a moment of carelessness and the weeds break through, the ineradicable weed of historical truth“. The Schaefer Siblings’ resonant question here is: “Do we live, or are we lived?” Their stance is about paying no heed to fear – the fear which makes us ‘lived’ by tyrants and in dread of ever having proximity to relatives and friends whose opinions might reflect on them and be rendered socially ‘untouchables’ (or even on which court benches one chooses to sit in political courtroom cases, after which, in Britain I found myself blacklisted as an international TV commercials actress, effectively ending a life-long career). In essence the Schaefer trial concerns emotion, warnings versus threats, but whose, and to whom is the danger, and which is which? Is it not a tyrannical law if one cannot make distinctions on questions of public interest? Monika and Alfred think it is and their intention is to warn of such an insidious threat to free, open and fair scholarship and public opinion. Some people have a ‘nose’ for sensing the difference, while others have nose for sensing conditioned fear and the sense to flee from where benign debating is equated with threatening. Into the latter class of Plato’s estimation, might fall Sefton Delmer, and likewise Benjamin Netanyahu. And into Plato’s first category might arise the person who nevertheless, in fearful kindness, stepped forward to advise me to „flee now!“ after participating at a conference in 2009 on “Denial and Democracy in Europe” at the European Parliament building in Brussels. I had just finished pointing out to the assembly that the document Netanyahu likes brandishing before the UN General Assembly reveals nothing new. Professor Robert Faurisson was the first to discover building plans for the Auschwitz crematoria when he visited the Auschwitz State Museum Archives in March 1976; his findings were first published in an interview with the Spanish magazine Interviú in 1979 – thirty years before Netanyahu’s brandishing of similar plans. The earliest set of plans had referred to one Krematorium with a Leichenhalle (literally ‘corpse hall’ or mortuary) and to small-sized WW2 disinfection Gaskammer (delousing gas chambers); later plans showed four additional crematoria with a slightly different term Leichenkeller (also meaning mortuary). Although one of the documents displayed by Netanyahu includes the word Gaskammer (‘gas chamber’), Prof. Faurisson has long argued that this simply labels a small disinfection chamber for clothing. To the dismay of Faurisson’s critics, Prof. Robert Jan van Pelt, certainly no revisionist (as I know firsthand) and described by the Israeli press as „an internationally acknowledged expert on the planning and construction of Auschwitz”, agreed that the ‘new’ documents purchased by the German sensationalist newspaper Bild and later deployed by Netanyahu did not depict a homicidal gas chamber and that “the words ‘gas chamber’ on one of the drawings meant a room in which disinfection of clothing was done by means of gas“ (as cited in Haaretz, 10th November 2008). Even Haaretz, on November 10th, 2008, reported (though mainly for its Israeli readership) on the doubt cast by Professor van Pelt and several other Jewish scholars who expressed doubts about the significance of the story published by the popular (and some might say, salacious) German magazine Bild. Haaretz headlined “Auschwitz Expert: Blueprints Found in Berlin Not a Death Camp”…. and that van Pelt (“a internationally acknowledged expert on the planning and construction of Auschwitz “) had said these documents “have been known to scholars for many years and that they were …plans for the building of a forced labor camp”. At the E.U conference, and immediately after uttering my words concerning Netanyahu and Faurisson, I was advised to flee not only the building but also the country (!) 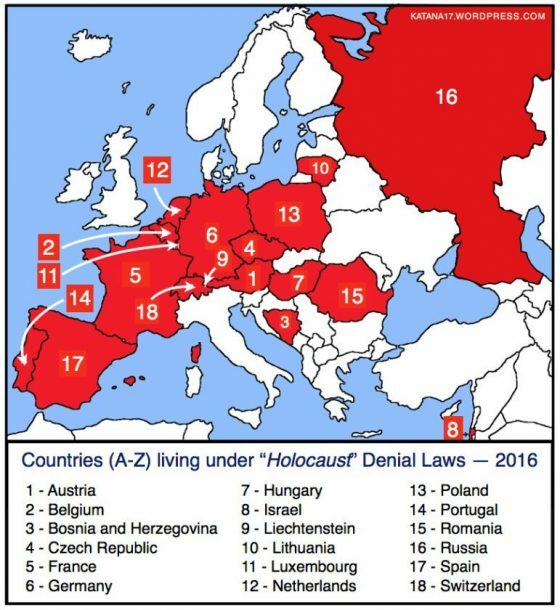 – in case of imminent arrest in Belgium where “Holocaust” querying is punishable heresy. It so happens that Prof. van Pelt had acted as an expert witness for Professor Lipstadt in a major, high profile, civil action in London’s High Court brought by British historian David Irving against Deborah Lipstadt (who had succeeded in influencing major book publishers into foreclosing on their contracts with this former best selling WW2 military historian. I attended every day of that lengthy trial. Unconcerned to be seen sitting on Irving’s unpopular side of the courtroom (having never before heard of him or of historical revisionism and therefore a “Holocaust-believer”), I was also curious to be there for the judgment. On that day, Prof. van Pelt (in a somewhat intimidating manner), sat next to me in order to share his copy of the pages as the London judge read out his damning verdict against the British historian David Irving. What a pity Van Pelt did not come out with that statement then during cross-examination. It could have reversed the verdict! In the Haaretz article (eight years later) van Pelt gives no proof that the original plans were ever changed though he tries to hint at this by suggesting “that they were not plans to build the extermination camp of Auschwitz-Birkenau, but rather earlier plans for the building of a forced labor camp”. So no mention of any subsequently hinted at plans to “build the extermination camp”, whilst stating that “there’s nothing new about these documents” nor stating that there ever were newer documents? Prof van Pelt said “ the words „gas chamber“ on one of the drawings meant a room in which disinfection of clothing was done by means of gas, and that the sketch is not of an extermination camp established in 1942, but rather of earlier plans for a huge concentration camp in which a force of 130,000 slave laborers was intended to work”. My point is that one can observe that people now breathe daily an atmosphere of such “politically-correct” anxiety that they must ’self-flee‘ in case someone may ‘shop’ them for listening to or expressing what Alfred terms conditioning ’trigger‘ opinions, that is, opinions which trigger fear of association if seen by others to allow themselves to listen. Alfred Schaefer told the judges that if WW1+2 had not spawned this foul Sefton Delmer war-propaganda and if this post-war propaganda had not been accepted by the public as historical truth (despite the stone tablets at Auschwitz having still to mean emotionally that 6 minus 3 million equals 6million on pain of “diminishment” heresy), then there would have been no “9/11”. He claims: “The world would not have become so gullible to fall for falsehood wars on countries to create enemies we did not have”. The fact does remain, there is still no proof that Osama bin Laden did “9/11”. No White Paper has been produced. The unsubstantiated issue was dropped after all the barbarity of Allied bombs delivered their permanently contaminating substances upon the helpless Iraqi nation’s civilians. Fear mongering by media and lies told by State leaders incited an “Allied” assault on a sovereign State which had already proven it had no WMD at all and without a shred of evidence save an incredibly pristine Arab passport found in the inferno of “9/11”. Like Plato notes: “Those who tell the stories rule society”. One is prompted to recall, especially as the trial sessions neared the anniversary date of July 22nd 1946, when Jewish terrorist Zionists planted bombs in a landmark site, the King David Hotel in Palestine. Jewish terrorists demolished the British quarter where files were kept of their treasonous activities towards the British during WW2 who were even then facilitating their entry into that British-mandated land while Jewish terrorists dressed as Arabs and left a little “Arab evidence” behind in one of their many false-flag operations during the 1940s. Sometimes disguising themselves as British soldiers, Jewish terrorists kidnapped off-duty soldiers, strung them up with piano wire, booby-trapped their bodies to blow up comrades who came to cut them down. I have unique archived footage of some British soldiers whose officers told them that: “Jews deciding to occupy Palestine after two millennia to claim it all for themselves [as per Herzl’s 1897 blueprint] is as preposterous as if Romans today came to Britain after two millennia to claim Britain for themselves”. In peacetime (if not wartime) the public has its right to opinions if democratic rights are real. If not, in neither peace nor wartime, then when? The Schaefer sibling trial, in essence, is a cry for freedom of opinion: is it threatening to be fair? Alfred explains to his judges that in his videos he suggests that if Jews, who still remain silent in the face of what they may know, and who thought it was good that children were already being taught lies in the kindergarten about the “Holocaust”, he could not understand how they made themselves complicit and would have to reckon with the violence turned against them when the truth comes fully to the light. Surely an opinion expressed as a warning not a threat? Alfred continued to “teach” the judges in the style of his videos: “There was always the same mastermind beneficiary financing both sides of every war, proof being that our nations are all in its usurious war debt with fear of the piper to whom we must be in tune. The Brothers Grimm cautionary tales, authentically interpreted, still warn of this in fables”. Alfred informs the judges that it was a Jewish-Bolshevik gang who murdered the Tsar’s family and through this shock and awe, traumatized the people so much that they no longer had the courage to resist. The people would have endured anything out of fear for their lives because of the Bolshevik atrocities inflicted upon those who dared criticize. “Do it to Julia not to me!” screamed Winston in Orwell’s 1984! Orwell was not ahead of his time, he wrote of his time, and Pontius Pilate feared likewise, according to Jewish fables. In the second Brainwash de-conditioning video, Alfred Schaefer also used the following quote: „Wars are always the harvest of the Jews.“ His video argues that the Jews had always made good business with the wars and were now working to set up the social engineering circumstances to engender an inter-gentile WW3. After reading the translation of the video voiceover, Alfred was asked why he did not just make a video about “9/11”, but always made a connection to the Jews and to Israel? Alfred Schaefer maintains that, of course, there is no other way, because everywhere the Jews had their fingers involved in the profit game. On sailing tours Alfred explained that he has various CEOs, engineers and others, and meets well-to-do people who surprise him, for many of them knew that “9/11” had not gone down as it had been portrayed in the media. He also met an established, much-vaunted journalist who claimed she could publish everything. He predicted to her that if she could publish the truth about “9/11”, she would be unemployed the next day. This probably, given the syndicated global media, meant that investigative research on “9/11” would not be published despite the press motto of ‘need-to-know’. And indeed, it came about as Alfred Schaefer predicted, because the media has never published anything wide-spread, doubting the official version of the many scientific curiosities and anomalies which comprise the events on “9/11”. The wisdom of Plato again comes to mind: “If you do not take an interest in the affairs of your government, then you are doomed to live under the rule of fools”. “All the great events have been distorted, most of the important causes concealed, some of the principal characters never appear, and all who figure are so misunderstood and misrepresented, that the result is a complete mystification”. The charge number five against Alfred relates to a sequence from an older video with a lecture by Ursula Haverbeck. Frau Haverbeck is an elegant and eloquent German lady in her ninetieth year, currently in prison for simply asking forensic questions to leading Jewish organization for five years. Having received not a single reply in these years of patient and polite requests, she has concluded that they cannot give her the precise location of the “crime” of the “6 millions” and the whereabouts of the “bodies” pertaining to that “industrial mass murder” in whatever form are their remains. The late great Austrian attorney Dr. Herbert Schaller was in his 85th year when, on Appeal, he succeeded to have British historian David Irving released from a Viennese jail for 10 words he uttered to an undercover journalist 16 years beforehand. Because of this success, the Austrian authorities (whose “Holocaust-denial” laws and punishments are even more severe than those laws in Germany) created a special law to prevent his taking on more cases, saying no-one in his field may now work over the age of 70! Quite ageist yet no-one fought against this contrariwise bias in the face of his obvious competence. Dr. Schaller clarified that there is no precise definition of what the “Holocaust of 6 million Jews” is and because there is no precise definition of the so-called unique homicidal mass murder weapon and how scientifically it works and thereby what is being “denied” in the absence of these precise definitions. Usually crime reports require bodies or their remains, precise location of each crime, precise means of each death. Alfred and Ursula have in common goal the determination to expose this forensic-denial and historical source critical-denying terror in their persistence to see nailed down the slippery vagueness of the emotional narratives and the whereabouts of the unique operational manuals or evidence of said industrial mass murder weapon. Van Pelt also told Haaretz that the words „gas chamber“ on one of the drawings meant a room in which disinfection of clothing was done by means of gas, and that the sketch is not of an extermination camp established in 1942, but rather of earlier plans for a huge concentration camp in which a force of 130,000 slave laborers was intended to work. Try citing that in public and it is behind bars for you and anyone prepared to risk listening “too well”, including your lawyer in now 20 countries and counting. The answer why this must be so is for many ordinary citizens increasingly unsatisfactory as I found on the streets in Munich. Someone with his/her own opinion, natural sense of enquiry, to then draw fearless conclusions is considered by the State to be as dangerous as any mass murderer, proving the morbid nature of the Basic Law paragraph 130 upon the standards of crime and punishment in many European courts burdened with “Holocaust” uniquely heretical, anti-forensic laws and Teaching Guidelines. The leading judge asked Alfred why he always speaks in his videos of the „Chosenites“? Answered Alfred Schaefer to the effect that the “Chosen” ones themselves could better explain what was meant by that. The prosecutor made it quite obvious that she was not interested in the videos. Witnesses observed her constantly busying herself with other things during the screening of the videos and avoidance of attention to the performances…. or is it avoidance of ‘contamination’ of her comfortably “conditioned” mindset, asks Alfred? In the French court, in supposedly a secular country, I witnessed the State Prosecutor in her courtroom stand praying audibly to “Yahweh to protect her Chosen People from Prof. Faurisson’s deceitful lips”! Alfred is succeeding to have his four judges, the tiny press and public gallery presence listen and watch all his video output as professionally translated into German. The third video, Part 3 of Alfred’s de-Brainwashing Series, was shown only as long as the official German translation was available. Its contents, which concern the subtle conditioning and advertisement-persuasive manipulation of our minds, will be described in the Day 8 report. Meanwhile a New Development by Ottawa Civil Liberties Association shows support and expression of Monika Schaefer’s rights. A Canadian correspondent, Lynda Mortl, has been sending my trial reports to the Ontario Civil Liberties Association researcher Denis Rancourt, and Joseph Hickey. Having prompted them to action, the OCLA came out publicly about the appalling plight of their Canadian fellow citizen Monika Schaefer. At least, the OCLA spoke up in the absence of any media outcry and media failure to question the global ability of special interest groups to exert their influence abroad to have a foreign power imprison indefinitely a Canadian citizen for expressing her opinion. Thoughts and hatred are not to be deemed criminal if our Hellenic skeptical tradition still reigns. At the very least, one would expect when questions are raised that the burden of proof should be on the foreign power to prove Monika’s alleged “incitement of hate” has prompted criminality in consequence of her simply recording her benign opinion on the internet regardless on which part of the Western Hellenic hemisphere she was standing at the time. The Schaefer siblings are accused of aggressive intimidation of people with their videos – this now includes alleged intimidation of their own relatives on a postcard! They said nothing at all like “Send Renouf ricin in a get-well card” which both the Royal Mounties and Scotland Yard deemed unthreatening though widespread on the internet and that the culprit had been identified as a former Israeli “settler” now residing in Canada. As I have found out on the streets of Munich, citizens fear attending such political trials because to enter the public gallery they must show their identity card. This intimidates citizens who worry they are being enrolled on a B’nai Brith Internationally policing watch list. Similarly, citizens fear the same watch-list entry when, in order to watch Youtube, they encounter a warning: “The following content has been identified by the YouTube community as inappropriate or offensive to some audiences”. Then they must click a button that reads, “I understand and wish to proceed”. As it happens, years ago I acted in a Cable and Wireless TV commercial, advertising the censorship button. Many people, including myself at that time, thought this button offered viewers the choice not be subjected to brutalising visuals. Now I, and others, wonder and worry. Were viewers simply being mis-sold an intimidation button to be fearful of exposure to normal skeptical, “heretical” disdaining opinions on history and current affairs? Canadian Monika Schaefer is on trial in Germany for what is misleadingly termed “Holocaust denial”, and has been held in jail for seven months without bail. The idea of the podcast was to speculate why the former Green Party candidate and Jasper National Park warden went from “social justice warrior”…well, to social justice and free opinion for Germans. Yet justice for the vanquished is not an option in the prevailing Allied victors’ laws for German citizens who live without sovereignty over their own land. The Star reports: “B’nai Brith Canada has been monitoring the Schaefer siblings’ “hateful” online videos for years and was among the groups that notified German authorities about the 2016 video, which was made in Germany, said the global-networking Canadian group’s CEO Michael Mostyn”. The OCLA had sent a letter to the Minister of Foreign Affairs of Canada and the Minister of Justice of Canada asking for their intervention in the case of Monika Schaefer. Monika’s attorney is likely to take an interest. The OCLA researcher sent Lynda links to their Letters for her email list to update supporters on their efforts for fellow citizen Monika Schaefer’s release. By contrast, the response to a Letter sent from the OCLA (to Minister of Foreign Affairs of Canada and cc’d to the Minister of Justice of Canada) was fobbed off with an opaque answer from the Director of Consular Case Management with “Privacy law” disdain when offering no public-need-to-know transparency concerning a fellow Canadian citizen’s appalling plight at being locked away behind bars indefinitely in a foreign land. There are other worthy Canadian citizens with a civic-minded attitude towards free opinion writing Letters to Editors and blogging, for example, Roger Currie. He is a semi-retired Winnipeg broadcaster & blogger who stands up to B’nai Brith Canada to say: “Her right to freedom of speech and protection of person should be the same as the rest of us”. Yet the Süddeutsche Zeitung newspaper (published in Munich, Bavaria, one of Germany’s largest papers) continues to play down all reporting. This means the public need-to-know is ignored and thereby explains the low public attendance (which does not equate to potential public interest). The citizens are being kept unaware of the trial …even if they were willing to overcome their fear of being fingered simply for their interest in the issues, since they must identify themselves for public access into the courtroom’s public gallery. Surely this amounts to an anti-democratic act of stifling so-called politically incorrect information? This is one of the accusations Alfred and Monika Schaefer are leveling at B’nai Brith Canada whose international interference resulted in Monika Schaefer getting locked up in a foreign prison. As dual loyalist Shimon Koffler Fogel is CEO of the Centre for Israel and Jewish Affairs (CIJA), one might ask if he is suitably unbiased for task of speaking up for a fellow countryperson’s rights? “Did I tell you not only are they ignoring me, they –as in Ottawa — have forbidden the Canadian consulate here in Munich, to attend the trial. Did I mention that already? I mean let me be clear, [I know] their job would not entitle [their] defending me or interfering in the laws of the land. They would simply be observers to observe if I am getting fair treatment. [Yet] That’s all forbidden!”. Could Monika and Canadian citizens reasonably assume that as few witnesses as possible are deliberately being kept from exposure to the Defence being presented by the Schaefer siblings in their trial? Are the opinions of the defendants already prejudged as heretically dangerous to adult human hearing? Later in the trial sessions we learn that, at the request of the Prosecutor, two attending young trainee teachers were asked to leave the room because they were not supposed to attend the subsequent reading of the German-language translation by an interpreter of the Schaefer videos. Is this yet another instance of German citizens being deliberately kept from exposure to the Defendant’s de-conditioning arguments as if children rather than trainee teachers permitted to assess controversial opinions? The Schaefer opinions do not risk brutalizing civil society by merely questioning and debating public opinion conditioning. Yet we are seeing how the “hate” law is prompting family members (school teacher members) to brutalize their own, and out of fear by association, leading them to inform on the siblings and send them to prison. “Do it to Julia not to me”! Do “hate” laws (in reality, “fear” laws) unelected by citizens, and historical accounts labelled so “obvious” that they are forbidden to be investigated in a democracy, spell tyranny? Is “para 130” a bad idea to call it criminal to incite the general public simply to ask questions and query government policies? The world should take an interest. Is that interest in itself sedition, or a democratic citizen’s right? Which type of school teacher do we think we train in our schools, the teacher who sends critical thinkers (on postcards) to prison, or the teacher who warns of the collision ahead of the way current affairs are going, and history has gone? Is “para 130” setting us on course for our advance to barbarism? The hearing continued the following day, Tuesday July 17, 2018 at 11:00. I'm reporting from Munich, where Monika and Alfred Schaefer are facing a trial. They are being accused of having denied the Holocaust. Im very thankfull, that youtuber Hendra Kremzow did a short summary in English for you. We all know the Holohoax happened, don't we? Reagan told us so, and he wouldn't lie to us. Some of us ... were a little shocked when old Reagan, in a private conference with some of his Jewish patrons, solemnly asserted that he was a witness to the truth of their fictitious Holohoax because he had been an Army photographer in Germany in 1945 and had seen with his own bright eyes the awful wickedness of the Germans, who had exterminated so many millions of God's Darlings. Some of us were disappointed that he lied; more were disappointed that he lied so brazenly, when he knew full well that the records, available to everyone, showed that he was never in Germany or even abroad while he was in the Army, and that he fought the war in Hollywood, where he manufactured "morale" for the men at the front, while preserving his own precious skin from the risk of abrasions. --- Professor Revilo P. Oliver; "REAGAN -- EYE-WITNESS TO THE HOLOCAUST?" She wants all of us to learn what the lies have to teach, that living under them is not life. The trial in Germany of two siblings, both Canadian citizens, for denying the Holocaust has ended with jail terms. According to Anne Wild, a photojournalist who monitored the trial for The CJN, Alfred Schaefer, 63, who lives in Germany, received a prison sentence today of three years and two months. His sister, Monika Schaefer, 59, who lives in Jasper, Alta., received a term of 10 months. But since she has been in prison since the charges were laid in January, she was set free, with her time already served. The siblings were tried together on six counts of “incitement to hatred” for producing and posting at least one video in which Monika Schaefer denied the Holocaust. The trial began in July in Munich. Monika Schaefer was in Germany visiting her brother at the time and was arrested while attending the trial of another Holocaust denier. She’s a musician and activist who was born in Canada to German parents and was the federal Green party’s candidate in the Alberta riding of Yellowhead in 2006, 2008 and 2011. According to Wild, Monika Schaefer told the court, in German, that, “I’m convinced that the Holocaust is a great untruth of history.” She said she made the video to make peace with her mother and that she wrote the script. Wild said the trial heard evidence that the video was produced by Alfred Schaefer in the town of Tutzing, outside Munich. Monika told court that she knew it would be published online. In May, Alfred Schaefer was convicted of incitement to hatred for a speech he delivered in the German city of Dresden in February 2017. He was fined 5,000 euros ($7,700). It was reported that at the start of his trial, Alfred Schaefer delivered the Nazi straight-arm salute in the courtroom. It was not clear as of Friday whether the verdict or sentences will be appealed. Thanks so much for keeping us up to date with this example of the demonic nature of the jews!!!! I'll paraphrase a sentence I actually heard in a Christian church by a Christian minister: "You can try to legislate morality, but there is no way in the world to make laws that force people to love each other." And, the jews will NEVER make me love them!!!!!!!!!! Although I'm an "old Deep South" Christian, I'd love to see Pissreal with a nuclear glow. Well, I can wish, can't I? Monika Schaefer's First Public Appearance Since Imprisonment in Germany! Page generated in 0.22568 seconds.